A low-level drug dealer (Dan Stevens) comes to ex-cop Matt Scudder (Liam Neeson) seeking his help after his wife was kidnapped and killed despite him paying the ransom. Scudder reluctantly accepts the job, uncovering a murky series of events along the way. 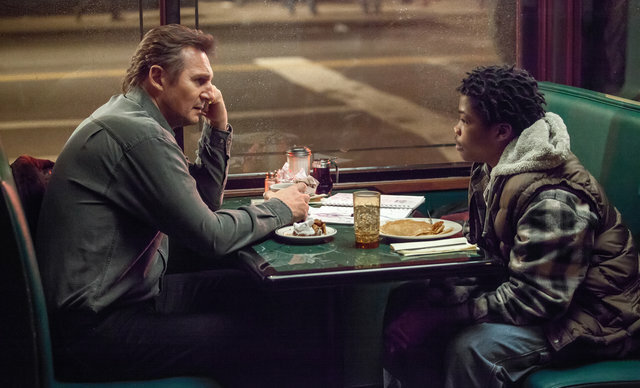 Liam Neeson once again plays a retired, ex-alcoholic cop with redemption issues but he does it so well. Anything that involves Neeson with a gun these days is worth your time and A Walk Among the Tombstones follows suit. It may be a tried and tested format but Neeson brings quality to everything he touches. Throw in an odd-ball friendship with a local street kid (played by the impressive Astro) and yet another sensational phone call (a’la Taken) and you have a competent, effective thriller. Scott Frank competently adapts and directs Lawrence Block’s grim crime novel to mixed reactions. The action and suspense builds very well throughout the film and the redemption story has legs to it. There are some well-constructed set pieces and at times it holds you at the edge of your seat. Where the film falters is in its tone. It’s all over the place and never gives the viewer any sense of identity. There are some light moments, especially between Neeson and Astro, but these end up conflicting with the tones of the rest of the film (which is sometimes too dark and nasty for its own good). These bad guys are horrendously bad too. Whilst the movie doesn’t really show anything, it implies a hell of a lot and some of their acts are nothing short of reprehensible. By setting their stall out in this way, the only outcome that can possibly work for an audience is an all out war. Taken did this perfectly. This doesn’t happen here, at least to the levels that it should. I believe a fundamental point to films like these lie in us witnessing the bad guys get their due comeuppance. That just doesn’t happen to a satisfying conclusion here. A Walk Among the Tombstones is a good action thriller but there are a few niggling problems that prevent this from soaring. In Liam Neeson however, you can always find redemption and his performance alone is worth the price of the admission ticket. Neeson means business and is back to his explosive best (in terms of action) in this hard-hitting and unflinching drama. Throw in great cameos from former Downton Abbey alumni Dan Stevens, the always-brilliant Eric Nelsen and perennial bad guy David Harbour and you have a dark and disturbing, tension-filled story that hits most of its desired marks. Hellboy: the official trailer has landed and it’s pretty epic!